When you're packing a Qualcomm 8250 Snapdragon processor under the hood, it would only make sense to radiate that need for speed with a fitting exterior that'll let people know the kind of power you're holding in the palm of your hands. That's where Acer's Liquid E Ferrari Special Edition comes into mind as the device was announced to being bound for India, but there's still no time frame on when it'll actually be made available in the country. 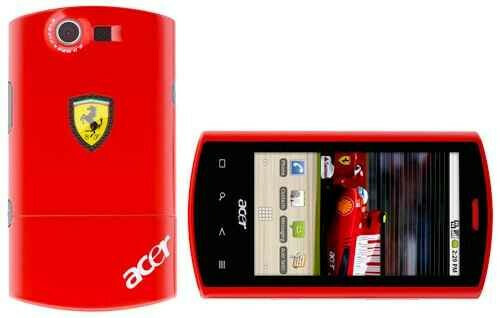 As the name implies, this Android 2.1 powered smartphone has a flare for Ferrari-specific enhancements which is clearly evident with its Ferrari red paint job and logo prominently found on its rear. Internally, we're presented with the usual assortment of hardware such as a 3.5” display, 5-megapixel camera, Bluetooth, and Wi-Fi. The Ferrari theme doesn't stop with its shell since that there are special Ferrari wallpapers on board which are reported to brighten up the homescreen just a tad bit, additional images & videos, and a special set of Ferrari-engine ringtones. Even though it'll make its way to India, pricing for this special edition handset is still unknown.